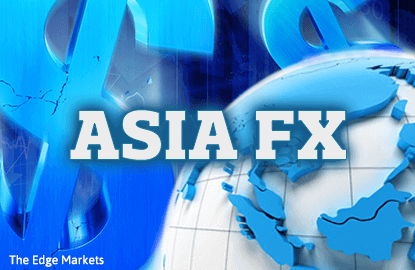 SINGAPORE/SEOUL (Jan 16): Asian currencies fell on Monday, as investors awaited comments from Federal Reserve officials this week and Republican Donald Trump's inauguration for clues on the outlook for U.S. policies and the dollar. The regional currencies gave back some of their gains from last week, when the dollar fell after a news conference by Trump offered little clarity on his fiscal policies. The South Korean won fell 0.6% as traders bought the dollar on dips. Dollar-buying by local importers also hurt the won, traders said. The Philippine peso slipped 0.5%, pressured by dollar-buying by foreign players. Gains in Philippine equities, however, helped limit the peso's losses. The downturn in Asian currencies came on a day, when the dollar climbed against sterling. The British pound dived to three-month lows after media reports that the British government is prepared to make a "hard" exit from the European Union rekindled investors' fears about the impact of the impending move. Regional currencies are likely to stay on the defensive ahead of Trump's inauguration on Jan 20, especially given the risk that he could elaborate on his fiscal policies, said Masashi Murata, currency strategist for Brown Brothers Harriman in Tokyo. While Trump's stance on the dollar will be a focal point, he will probably avoid expressing any strong displeasure against dollar strength for now since U.S. economic growth has been firm, Murata added. "It probably doesn't matter whether the dollar is strong or weak, as long as the economy is doing well," Murata said. "There are also merits to a strong dollar as that can make it easier for money to head toward the United States." Trump, who has said in the past he would label China a currency manipulator after he takes office, said in an interview with the Wall Street Journal published on Friday that he wouldn't take that step on his first day in the White House. But he made plain his displeasure with China's currency practices, and the Journal also quoted Trump as saying: "Our companies can't compete with them now because our currency is strong and it's killing us." Investors will also be watching a series of comments by Fed policymakers later this week. These include Fed Chair Janet Yellen, who is due to speak on Wednesday and Thursday, and Fed Governor Lael Brainard who is scheduled to speak on Tuesday.